We are and acoustic folk band from Chepstow in the United Kingdom. Some of our songs are about historical figures (Dylan Thomas, Otto Lilienthal, Wallace Hartley). 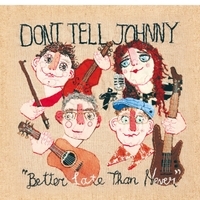 This Album is a collection of original songs written and performed by Don't Tell Johnny. Don't Tell Johnny are based in the UK in Wales and the West Country. Members of the band are Sam Brown (vocals), Tim Brown (vocals, violin, guitar), Jon Marsden (guitar, vocals) and Nerijus Vizbickas (guitar, bass). The Album was recorded in the Autumn of 2015 in Chepstow, South Wales, by Paul Hobday of Scabby Road Studios. The Album was released in February 2016. The Album Artwork was produced by Bev Baddeley. Beyond Your Wildest Dreams. The inspiration for this song is Otto Lilienthal. He was an early aviator who made great progress in the development of hang gliders. He was known as “The Darling of Fliegeberg” (literally ‘fly hill’). Lilienthal published a famous book, ’Birdflight as the Basis for Aviation’ in 1889. The Wright brothers took great inspiration from his work. Lilienthal was sadly killed when one of his gliders stalled unexpectedly. His last words to his brother Gustav were ’sacrifices must be made’. Air travel, that we all take for granted these days ,was made possible due to the work of early pioneers such as Otto Lilienthal. Caitlin’s Daughter. Inspired by our close proximity to Dylan Thomas’s boathouse while on a songwriting trip to Laugharne, the last place he lived with his wife, Caitlin and his family before his untimely death. Severn Princess. A song about the last remaining Severn Ferry which connected England and Wales before the Severn Bridge was built. Our good friend was part of a group that paid £1.05 for the ‘wreck’ and had it brought back from a boat graveyard in Ireland. It is currently dry docked underneath the A48 bridge in Chepstow. Myn Mawr. A song inspired by the rugged slate landscape around Llanberis, at the foot of Mount Snowdon. Play On, Mr Hartley. A song about Wallace Hartley – the band-leader on board the Titanic who demonstrated his love of music by continuing to play with his band as the ship was sinking, in order to instil a sense of calm among the passengers.